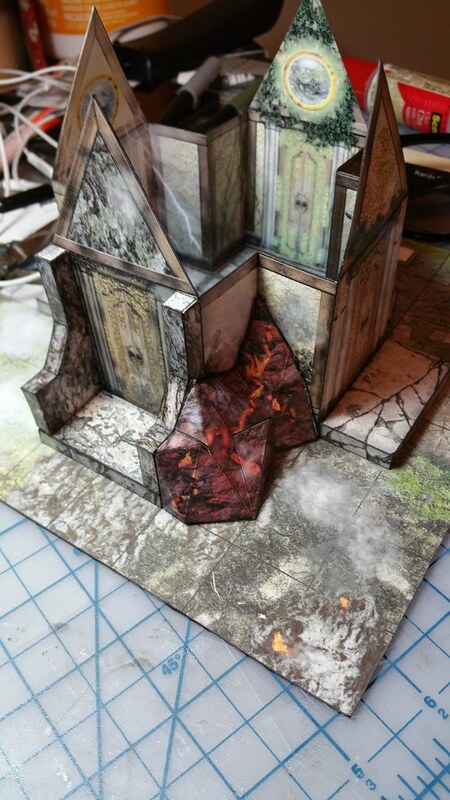 My newest model, the Elemental Shrine, is Now Available! It features the elements of Earth, Wind, Fire and Water represented on each side of the building. 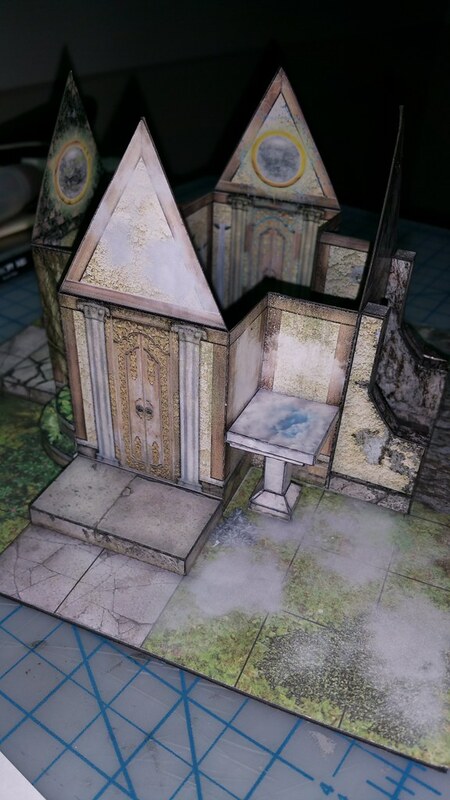 The kit includes unique props of a water fountain, cloud fountain, lava rock wall, planters and stone pillars attached to the model. 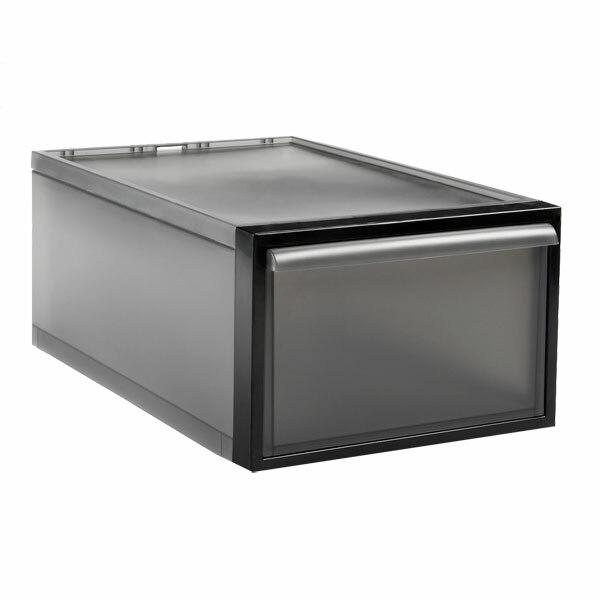 In addition, the roof is detachable, offering an interior design for game play. An email was sent out to all previous customers. 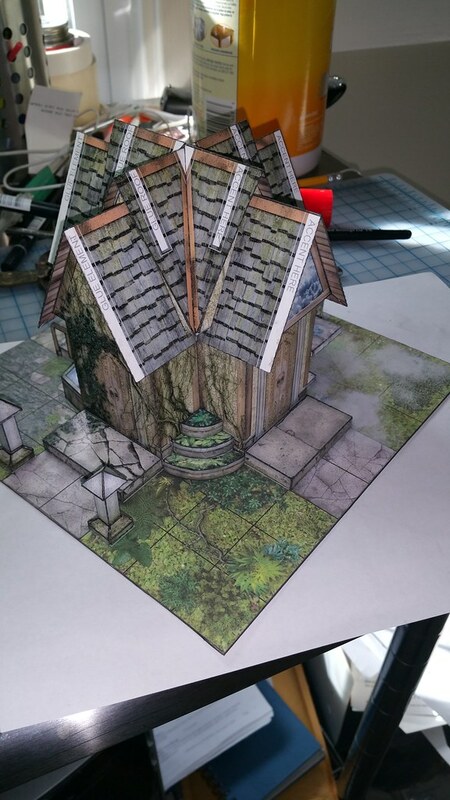 Love the look of this building Mr Jensen... Do you plan on doing more buildings with an oriental theme? I like the idea of creating scenery that's useful outside of the typical pseudo-medieval-europe fantasy setting. 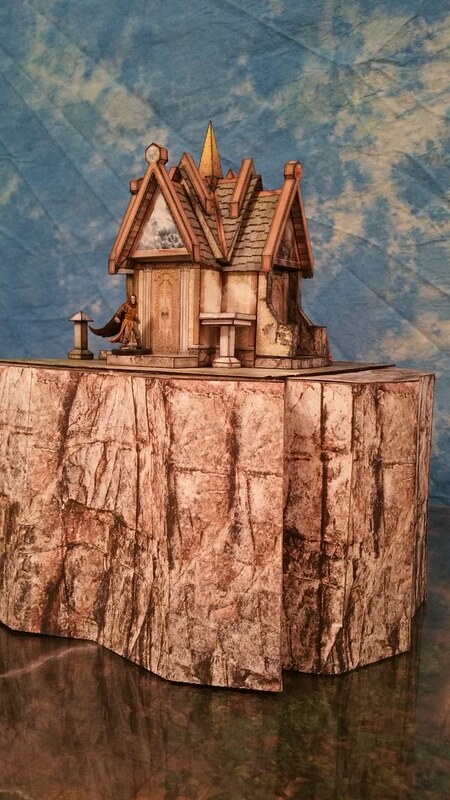 Plus those who backed said KS to the appropriate level to get the Mystic Mountain Stretch Goal products, and previous Mystic Mountaineers (= model purchasers) should have received a discount e-mail, which in my case has just been taken advantage of! Thanks Kevin! Regarding themes, I tend to create what inspires me and what I can use in my own games. That said, I tend to look for ideas that have never been done before, mixed with architectural concepts that are different from other model builders, as you can see from my product line. Thank you for the support! I'm always appreciative for those willing to write up a review of my models where they got them from. Lord Zsezse Works is in a class all of their own. Their work is simply amazing with artwork that is truly inspiring. However, that was not the case with the Elemental Shrine. The inspiration for the design came from other resources mixed with some things in various games I've played. This model is one of a kind. I have draft cutfiles for all pages (except the base) and I'm trying them out while I wait for jjensen to let me know how he'd like them distributed. Construction in progress... I'm really liking the option to turn off lines on the lava fountain! Also, cutfiles make this model much easier to construct (it's not for beginners or the fat-fingered without tweezers.) But so far it is absolutely gorgeous! As soon as I've confirmed that all the pieces assemble correctly, I'll be handing the cutfiles off to jjensen for integration with the published product as an update. So far, so good. I'm finding it easier to work with the roof in place - it's lifted more off the table (like an extra hand) and is structurally strong enough to "push back" as I'm waiting for the glue to set on all these accents, supports, and layers to tack-dry. With the way the exterior artwork is laid out on the pages, how easy would it be to print four of any one element? Or, with decent Photoshop skills, how difficult would it be to kitbash as such? Just had a quick look for you and I think other than a few duplicates depending on what element your after it's doable with no mod's in GIMP/Photoshop although you will use up a bit of extra paper. Most of the walls interior and exterior are on separate pages except wind and Water. The roof ridge pieces also have some custom pieces, three are on a single page so that'll cause some issues. The base will be the biggest sticking point as it has white marked areas to accept the elemental features on each of the internal/exterior corners (the bowl thing above and fire triangle you can see in oldschooldms pics). However you could just put the model down on a generic FDG or Dave tile and that'd work. You could cut stuff up in GIMP/Photoshop pretty easy and re-page it as mentioned above though the base will still be a big time investment. Maybe jjensen could upload one with no white area as an extra for the model (assuming he designed it the way i think he did) . Wow! Speedy response. Thank you so much. Great help. 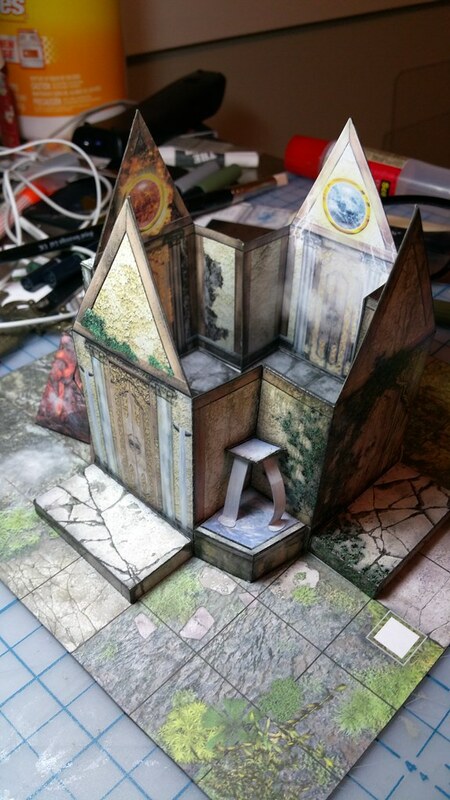 I don't mind the extra pages printing, and I have one of Dave's base tile sets, so I will probably get it and do a bit of repagination in Photoshop. Well - good question. First off - I make (often adapting) as many models as possible fold-flat. A quick search here of my name and "fold flat" will show about 20 threads in the "cutfiles" area by me sharing the kitbash. That saves LOTS of space. 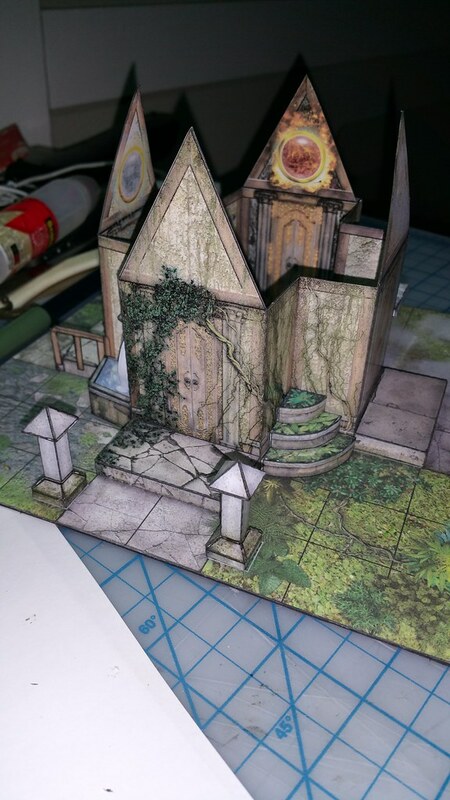 My recent build of the Magic Shop by Fat Dragon Games happened only because it was fold-flat. I don't need another medieval stiff box. Ravenfall builds will replace older non-fold flat buildings in my collection. recently I've build fewer and fewer of these kits. They have to be very, very special. It just so happens that jjensen's recent models are in that category about 50% of the time. For example, I've not built his Barracks as I don't have a need for it (it's rigid and very specific, where as a modular barracks for my game could more easily be built out of Fat Dragon Games walls, of which I have many. There are several of those filled with "stacked" models, and others with only a few rigid models, such as larger boats, mountain buttes, grouped together mostly by what fits together best. Oh yes, this means that BSGTony (lordzsezse)'s new elven kickstarter pieces will be adapted to be fold-flat, if they aren't when they arrive. I'm going to build a lot of that, and it needs to have a small storage footprint. Wow! That is one impressive build (of one impressive kit). Thanks for showing it off for us. Your pictures look great Randy, thanks for sharing! And a huge thanks for making the cut files! I will add them as a product enhancement. 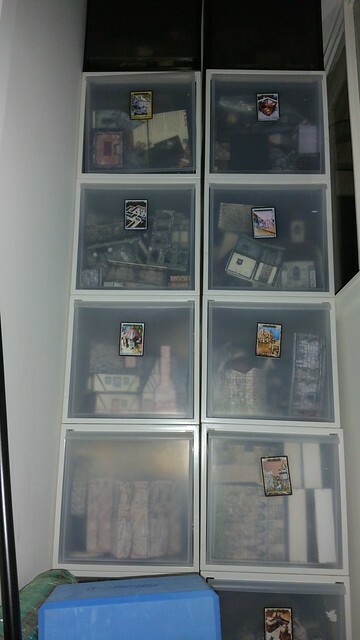 Here's my storage solution for this model: a custom built 8.5" cube box. Three are so many wonderful stickyoutybits that I had to protect this baby.